Emancipation & Liberation » AFTER GRANGEMOUTH – WHAT NOW FOR THE LEFT IN SCOTLAND? AFTER GRANGEMOUTH – WHAT NOW FOR THE LEFT IN SCOTLAND? The ignominious climbdown of the Broad Left UNITE leadership at Grangemouth highlights the need for the Left in Scotland to assess the political significance of this disastrous capitulation, which will encourage every employer to resort to similar dictatorial methods when dealing with their workers. Furthermore, the decision of the SNP government to bow to Ratcliffe and INEOS shows the kind of future workers can expect under the SNP’s proposed ‘Scottish Free State’. Below are three articles, the first by Allan Armstrong of the RCN examining the wider political implications. The second is from Jerry Hicks, the Rank & File candidate, who challenged Broad Left incumbent, Len McCluskey, for the General Secretaryship of UNITE earlier this year. Socialist Democracy (Ireland) sent us the third article. The decision of the UNITE leadership to capitulate before the demands of Jim RATcliffe, the billionaire owner of INEOS, and accept a cut in workers’ pay, conditions and pensions at Grangemouth refinery, represents a major setback not only for the workers directly involved, but for all workers in Scotland and the UK. This will also massively affect the communities of the Falkirk and Grangemouth area. They depend on the jobs, incomes and wider business generated by the refinery. There can be no doubt what the implications of this will be. Every employer in Scotland and the UK will feel a lot more confident in stepping up their attacks and enforcing ‘a race to the bottom’, using the current economic crisis, triggered by the banksters, as their excuse. Furthermore, following Ratcliffe’s example, they know that they can expect support from both the Westminster and Holyrood governments. These governments are quite prepared to offer such corporate blackmailers vast amounts of taxpayers’ money as a ransom to meet their demands. And, if Ratcliffe can not be appeased, then both the Con-Dem coalition and the SNP government are looking to other corporate buyers to take over the Grangemouth refinery. The Chinese government has figured high on their list. Ratcliffe and his smug Grangemouth chairman, Calum Maclean, clearly enjoy rubbing workers’ noses in the dirt; but the appalling bottom line for Chinese employers, when it comes to workers’ pay, conditions and safety has been highlighted in Hsiao-Hung Pi’s book, Scattered Sand, on the plight of new industrial workforce in China today. Whether it is Osborne welcoming Chinese government involvement in a new nuclear power station at Hinckley (and being awarded massive subsidies in the process), or Alex Salmond declaring an open season in Scotland for Chinese business investment here, this highlights two things. First, the UK is very much a declining imperial and industrial power, but neither the existing British nor the wannabe Scottish ruling class can conceive of any society beyond the existing ‘New World Order’ of corporate capital, backed by imperial power, whether it be American or Chinese. Secondly, neither the Labour Party in opposition, nor the SNP in government, despite criticising Ratcliffe’s lack of social responsibility, will follow the logic of this argument. If corporate business shows no social responsibility then is it not the responsibility of government to take this on? This would mean bringing such a key industry as oil refining into public control. However, you can be sure, whether as a result of Lord Sainsbury advising Ed Miliband, or the big business backers behind John Swinney, this is very unlikely to be the road taken by either Labour or the SNP. However, this debacle also highlights the dead-end strategy being pursued by the UNITE leadership under Len McCluskey. It was McCluskey who provided the backing that gave Ed Miliband the leadership of the Labour Party. Since then McCluskey has been involved in behind-the-scenes manoeuvring to get his preferred Labour candidates in place. Grangemouth and Falkirk have been very much at the centre of this, with former union full-timer, Karie Murphy, being pushed as the Labour candidate for Falkirk, backed by UNITE’s Grangemouth convenor, and Falkirk Labour chair, Steven Deans. Despite McCluskey’s earlier backing for Miliband, the Labour eldership saw this as an opportunity to court the right wing media and to attack Steven Deans and the UNITE leadership’s attempts to promote a Broad Left candidate. INEOS management saw the opportunities provided by this split and demanded that Grangemouth workers immediately sign a new contract tearing up their pay, conditions and pensions. The majority voted against, but McCluskey just ignored this, and capitulated before Ratcliffe, rather than fully mobilise UNITE behind its members. When it comes to talking Left, but acting Right, McCluskey has form. The UNITE leadership was one of the first to pull the plug on the brief inter-union unity achieved over public sector pensions on November 30th, 2011. The reality is that behind his Left talk, McCluskey does not go beyond tokenistic actions, preferring to see UNITE’s salvation in a future Miliband-led Labour government. Anything that threatens that is opposed. Thus, once McCluskey and Miliband had made a secret deal over the trade union (bureaucrat) link with the Labour Party, McCluskey thought his political strategy was once more on course. Ratcliffe understood that the UNITE leadership’s actions were more about enhancing bureaucrats’ power and career opportunities, than preparing their members for the kind of action and politics needed to face down corporate power. He saw his chance and has taken it. In the process, UNITE workers in Grangemouth have effectively been abandoned by their leadership and the Labour Party. The STUC offers little more than its condolences. The Red Paper Collective’s belief in the effectiveness of British working class unity, courtesy of the Labour party and trade union bureaucracy, lies in shreds. To an even greater extent than the SNP government’s climb down over NATO membership, the future of the Grangemouth refinery represents a pivotal moment in Scottish politics. This not only has economic and social consequences for all Scottish workers, but for the campaign for Scottish self-determination. The UK government will either appease Ratcliffe, or try to find another owner. The Scottish government is adopting the same approach. Whether it is accepting continued imperial wars under NATO, bowing to the City of London, or offering Scottish workers on a platter to the rising corporate power of China, neither the leaders of Better Together/Project Fear, nor the official ‘Yes’ campaign, provide any challenge to the unionists’ or nationalists’ decidedly non-self determining futures for Scotland. This is a key reason why the Radical Independence Campaign exists. Scottish self-determination is a much wider concept than transferring ‘power’ from Westminster to Holyrood. To exercise effective control, we must first of all control all those organisations we need to defend our jobs, conditions, welfare and social security, our environment and cultural provision. The Labour Party and SNP are run on corporate lines, reflecting the class interests they really pursue. Their bureaucratic machines are now designed above all else to advance politicians’ careers. Most trade unions are undemocratic, dominated by well-paid career officials, most of whom are appointed not elected. Any attempt to claw our way back from this major setback at Grangemouth will need a completely new approach. Rank and file union members can not accept the narrow sectional limitations of their unions. The STUC will not provide effective solidarity either, since it accepts the UK state’s anti-trade union laws, which are designed to nullify effective action. If a core of workers can begin to organise independently (which does not rule out attempts to utilise existing union structures, particularly at local branch level), then their appeals for support should immediately extend to other workers and the wider community. This could involve some of their more imaginative actions taken by the rank and file electricians in their successful campaign against the employers attempt to tear up their contract. 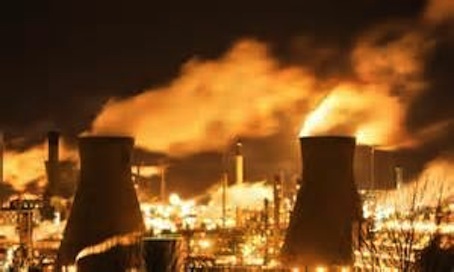 However, just as importantly, if such action were able to mount sufficient pressure for the Grangemouth refinery to be taken into public ownership, then the organisations involved should not then stand down and be content with such a still-limited gain. Nationalised industries, under state bureaucratic control, do not have a great record, when it comes to protecting workers and community interests. Public ownership should mean exactly that – the direct involvement of the workers and communities concerned, so that production and distribution meet social needs. Where workers and communities have already been organised prior to any implementation of public ownership, such far-reaching aims can become a reality. This is real self-determination in action – a way of extending this notion way beyond the prospects offered by the ongoing Labour/ConDem UK austerity coalition and the SNP government’s wannabe Scottish ruling class’s ‘Independence-Lite’ proposals. As Grangemouth shows, the vast majority of people lie outside any meaningful self-determination’ envisaged by these people. It is time for RIC to move up a gear and begin to organise for the genuine alternative – Scottish self-determination in a democratic, secular and social republic. When faced with yet another outrageous bullying exploitative boss, this time at Grangemouth in Scotland, Unite’s top leadership displays its abject failure. But where did Ineos get their confidence? And in a Union where all its officials are appointed, who would dare to speak out? The members of Unite have been superb, doing all that was asked of them, acting like lions, while they have been let down by the Unions top leadership acting like donkeys. Unite’s failure stems from not having the correct industrial and political strategy. This led to the prospective parliamentary candidate selection debacle at Falkirk. Where despite Labour being given members’ [£millions] money hand over fist and unconditionally. The man Unite gave £10,000s to become Labour leader, Ed Miliband, treated them with complete and utter contempt. This led Ineos to believe it could attack the Unite convener at Grangemouth. Which led to the Grangemouth ‘dispute’, which led to the biggest most powerful union in the country sending the worst of all signals to all employers and the Con Dem government alike – threaten us [Unite] and we will cave in. Unite should have an avowed intention to campaign for and to demand public ownership of utilities, transport, health, education and all energy supplies. Unite should end immediately its disastrous ‘reclaim Labour’ and with it the infantile, unfunny comic capers of infiltration through recruiting members to the Labour party. Unite should have only one relationship with Labour – “You follow our policies then you get our support”, and that goes for any party on the left. With these things, members will be clear what their union stands for. Employers, Con Dems and Labour will know what to expect. In my view then, the chances of winning disputes will increase as will the numbers of people wanting to join a principled, fighting, effective union – Where survival doesn’t have to mean surrender. Jerry Hicks was runner up in Unites General Secretary election in 2013 when receiving 36% nearly 80,000 votes. He is considered by many as being the only alternative voice inside Unite. Jerry Hicks was unlawfully sacked by Rolls Royce in 2005. He is on the now infamous illegal blacklist of workers. Unite is the biggest union in the UK with 1.3 million members and the biggest single donator to the Labour Party. The Grangemouth catastrophe, the unions and the socialist movement. On the one side, careful planning, cool calculation and utter ruthlessness, on the other bluster, moralism and confusion. At one level it is not hard to understand the outcome of the Grangemouth dispute or how the UNITE bureaucracy, led by Britain’s leading ‘left’ bureaucrat, Len McCluskey, went from giving notice of strike action, to embracing capitulation “warts and all” to finding themselves in a meeting in a state of unconditional surrender, with the terms dictated worse than they could have imagined. Pay is pegged for 3 years, bonuses have been cancelled, a final salary pension scheme has been closed, a no-strike deal rammed through and union structures ripped out of the plant. The workers face a sharp fall in their standard of living with no means to strike back. UNITE have struck many deals that let down their members and were happy enough to go into negotiation when INEOS laid out a number of these conditions. What has been a body blow to the bureaucracy is that the company removed their role as representatives. The union were locked out with absolute surrender the terms for ending the lockout. To add insult to injury, the final settlement involved dismantling much of the union structure inside the company. What is left will have the role of rubber-stamping management diktats. The resignation of Stephen Deans, one of the two conveners and the subject of an ongoing witch-hunt, is a sign of the union’s defeat. It is true that the UNITE leadership were utterly complacent, totally blindsided by the company and that they flew into a panic when they were locked out. The main substance of this article however is to argue that that does not sufficiently explain the defeat. McCluskey did not become the leader of UNITE because he is a fool or a coward and he was leading one of the most skilled and advanced layers of the working class with a long history of combat behind them. He is not a man to be derailed and humiliated by an empty bluff or to pass over weapons available to him if they could be readily deployed. What will be argued is that INEOS boss Jim Ratcliffe had objective pressures operating that made the attack necessary, rather than a whim or an act of malice. There were strong weapons in his arsenal that he had carefully considered and deployed and that when he struck, the potential defences crumbled before him. As any general, he then took the opportunity to seize as much ground as possible. If this is the case, the whole strategy of McCluskey, the Left bureaucracy and, in fact of the British trade union leadership as a whole has been completely overthrown. Not only that, but the different strategies presented by the socialist groups have also been thrown back. Simply to mouth standard slogans, as so many are doing, is not sufficient. We need a real and detailed analysis of the dispute and a regroupment of socialist policy and socialist organisation. Radcliffe claims that the petrochemical element of the Grangemouth site was losing money. The plant required modernisation and he was prepared to invest £300 million, but the other elements of the business plan required a wage cut, the dumping of the pensions plan and restriction of workers trade union rights so that the management can have free rein. UNITE dispute the company’s figures and say that the plant was profitable, but this is simply whistling in the dark. Comparing figures is no help when the fact is that the company’s policy has been based on this plan for many years of careful preparation. It is simply crying out “Do no evil!” and hoping for the best. The issue is how can INEOS be defeated? It is of some help to consider the background. Radcliffe is a billionaire, but not because he is really good at petrochemicals. He has made the transition from manufacturing capital to finance capital and has drawn heavily on bondholders who expect a high return on capital. He has also made an alliance with the Chinese petrochemical industry, with a history of superexploitation of Chinese workers and a plan of expansion into Europe. They expect to gain competitive advantage by modernisation – putting in fresh capital and stripping out workers wages and pension rights – exactly what is happening at Grangemouth. They have a number of advantages. There is excess capacity in the petrochemical industry and a number of refineries have closed. They have a large reservoir of capital available and the capital is very mobile, making it possible to threaten the closure of Grangemouth and the transfer of investment. The rise of fracking in the US has led to a fall in the price of US oil relative to North Sea oil and part of Radcliffe’s business plan is a fleet of large tankers that would import from the US. So, on the other hand, what were UNITE’s plans to defeat INEOS? The main thing to understand is that UNITE, the “broad left” current that Len McCluskey represents and indeed the union bureaucracy throughout Britain and Ireland, do not have a plan to defend workers rights other than to go along with the austerity in the expectation that capitalism will recover, now and again lobbying for a better way that is kinder and fairer to workers In Britain this strategy is based on a Labour government implementing austerity rather than the coalition. The recent privatisation of Royal Mail without a shot being fired is a classic example of a union bureaucracy in action. In that context there are two major strategic elements for the bureaucracy. One is to preserve themselves by insisting that they are allowed to represent the workers and that they negotiate the deal, no matter how poor the outcome. The other is to argue for a political current of reformism, a reborn left-wing Labour party, that will win the concessions in government that they fail to secure through industrial struggle. There are also issues specific to Grangemouth. The bureaucracy like to show that “old fashioned trade unionism” can deliver victories. At Grangemouth you have a 24/7 constant process plant, a highly skilled and unionised workforce and strategic product needed to maintain the economy in Scotland, the North of Ireland and northern England. This has given local advantages to the trade unions and enabled relatively easy victories. In 2008 such a victory was won. These were the forces aligned against each other in the battle for Grangemouth. One after one, in rapid succession the union’s positions fell. The weakest point of the union strategy turned out to be UNITE’s political orientation to the Labour party. Len McCluskey was the kingmaker who elected “Red” Ed Miliband as Labour leader, only to have him declare that Labour was a “One Nation” party and not any kind of workers party. A number of UNITE workers, with a number based at Grangemouth, then recruited to the local labour party in Falkirk with the aim of nominating a UNITE candidate. Miliband saw this commonplace activity as conspiracy, launched an enquiry and called in the cops, going on to announce that the party would be breaking its traditional links with the unions. The Labour witch hunt then transformed into an INEOS witch hunt. On the thin grounds that convenor Stephen Deans had used company emails an investigation was launched and disciplinary action undertaken. It was at this point that UNITE balloted for strike action and found their complacency shattered by the realization that a weapon can point in any direction. A continuous industrial process can work in the workers interest when the employer is unprepared. When the employer is prepared a lock-out can be devastating. Management initiated a “cold shutdown” in the petrochemical complex that involves weeks to restart and threatened total closure. In a panic, UNITE withdrew the strike call. INEOS, seeing their enemy off-balance and isolated politically, wrote directly to the workforce, offering a bonus for surrendering their rights. Around 50% accepted, showing that a large section of the workforce had no confidence in the union leaderships ability to pursue the struggle. The one remaining string in the bureaucracies’ bow – the strategic importance of the plant to the state – failed also. Britain, in the switch from coal to gas, long ago gave up energy independence. It is a country where financial capital massively outweighs industrial capital and where the current austerity, claimed to rebalance the economy, has in fact tilted the balance further towards finance capital. It is therefore not surprising that the British government and media, who would have denounced a strike as treason and blackmail, were fully in support of INEOS, that Labour leader Miliband urged UNITE to settle, or that the British government are supporting the conversion of the plant with loan guarantees of £150 million. Len McCluskey, standing in the ruins of all his carefully constructed strategies, responded with capitulation. He would embrace the INEOS diktat, “warts and all.” When he did get to the table the employer, ruthless to the last, stripped the union of its workplace organization, leaving a shell. Even after the defeat the rout continued, with the Conservatives denouncing UNITE for intimidation and Labour politicians calling for a re-opening of the Falkirk election witch-hunt. What of the socialists? Their usual relationship with the bureaucracy is to hear no evil and see no evil, but the Grangemouth debacle led to unprecedented criticism. Did these reveal a mechanism for a more effective fightback? The more simplistic criticisms were based on the assumption that the Grangemouth management were not serious in their attack. The best response to lock-out would be to call a strike! A broader campaign of public support will do the trick! Not far behind were proposals to nationalise Grangemouth. The old nationalised industries were nationalised by capitalist governments to ensure security of production and for many workers this ensued standardized conditions better than under individual capitalists. Advancing a call for nationalism today, when capitalism is tearing open the remaining public services and passing resources to the private sector, is sheer nostalgia. There is no mechanism for nationalisation, The Labour Party will clearly not oblige, a more left-wing labour is fantasy and a genuine workers party would simply expropriate the plant. Another casualty of Grangemouth was the current left enthusiasm for Scots independence and the credibility of the SNP administration. There is a wider theoretical question around the issue of independence for Scotland, but what the lockout showed was that the SNP has no radical edge which would benefit workers, or any alternate mobilisation of workers around the national question that would provide an alternative strategy. The case put forward by SNP leader Alex Salmond is that an independent Scotland would draw down large oil revenues and that it would use these revenues to run a welfare state that would meet the needs of workers and the poor. Yet, rather than being able to put pressure on the financiers behind INEOS, his administration is to support the restructuring programme and the cuts in worker’s wages with a grant of £11 million. Another layer in the British socialist movement is cohering around a “left unity” discussion. At the time of writing it has provided little in the way of analysis or discussion of the Grangemouth defeat. In fact most of its narrative is focused inward, around issues such as “safe spaces” for discussion arising from a particular interpretation of feminism or questions around the level of radicalism that should be demonstrated in the founding statement of a new party. This detachment is characteristic of the majority of the socialist movement. The trade union and labour bureaucracies retain the support of organized workers. The socialists are small and isolated and it is only at the infrequent trade union rallies that they can reach a mass base. This physical dependence has become political dependence, with the socialists failing to put forward a critique of reformism or a programme for workers and instead pursuing private projects and ignoring the reactionary role of the bureaucrats. By far the most healthy reaction to Grangemouth came from workers inside the UNITE union, from a large and organised rank and file movement led by the long-standing activist Jerry Hicks. They, at least, understand that a revived workers movement involves a struggle to displace the current leadership and build a fighting democratic union. They dismiss with contempt the McCluskey strategy of reclaiming labour and point out that the millions poured into the Labour party are answered with contempt from Miliband. There is however much more that must be said. The Grassroots formula of only supporting MPs who support the union has to be extended to the call for a new party of the working class. A class struggle movement in one union is a big advance, but it has to become a class struggle movement across the unions. The trade union and political fights have to be united around a movement that is willing to reject the claims of finance capital and to step in and expropriate capital where it is necessary to preserve the livelihood of workers. So was there a strategy available that would have led to a workers victory? It is clear that the response to lockout should be occupation of the plant. Sympathy action was also required, both throughout the petrochemical industry nationally and across INEOS internationally. The cost-cutting exercise at Grangemouth runs alongside massive price hikes and record profits in energy firms. The Labour party has promised a temporary freeze on prices, so a call could be made for a permanent cap and for a workers enquiry into the firms. In addition the British government have just announced a return to the installation of nuclear energy, outsourced to French manufacture and Chinese capital – a form of private finance initiative that has British workers paying at twice the current rate for 40 years. There are many issues around which a fightback can be organised, but they cannot be organized by the current leadership of the working class – for example the absolutely central weapon of the secondary strike has been illegal for decades, despite unions being the main financial backers of a Labour government. The fight to mobilize against the financialisation of energy and petrochemicals will involve absolute opposition to the interests of the banks and the financiers, self-organisation of the workforce, a willingness to mobilise and expropriate capitalist resources; all processes that can only be finalised in the construction of a revolutionary party of the working class. Grangemouth is not the Miners strike. It did not involve a large section of the working class nor was it a full scale confrontation between capital and labour. It was however a serious defeat, partly based on surprise, opportunism and ruthlessness on one side and complacency on the other. What it has shown up is the utter inability of the traditional leadership to defend workers and the demoralisation and lack of strategic vision on the part of the socialists. We have had a sharp shock. The task is to learn from the defeat and build a new movement, rather than fall back into apathy and the old way of doing things, the old dependence on left labour and the left bureaucracy..